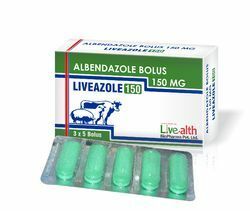 Our range of products include ivermectin & pyrantel chewble tablets, ivermectin and praziquantel oral paste, albendazole bolus (vet. 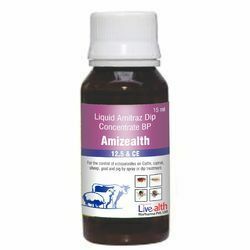 ), liquid amitraz dip concentrate 12.5 & ce (vet. ), haloperidol decanoate injection 20 mg and azaperone injection 40 mg/ml. 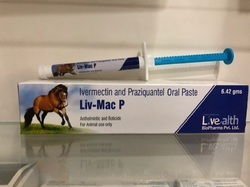 Ivermectin and Praziquantel oral paste for horses is a unique combination of ivermectin, a broad-spectrum antiparasitic and praziquantel, a compound active against tapeworms. Its convenience, broad-spectrum efficacy and wide safety margin make it an excellent antiparasitic product for horses.Oral Paste is a clean, white, homogeneous, ready-to-use paste contained in a disposable plastic syringe. Packing: 3 x 5 Bolus in a printed carton. Packaging Details: 3 x 5 Bolus in a printed carton. Uses. 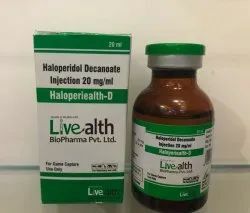 Haloperidol decanoate is used for long-term treatment of a certain mental/mood disorder(schizophrenia). It may be used in people who have trouble remembering to take medication every day. This medicine helps you to think more clearly, feel less nervous, and take part in everyday life. 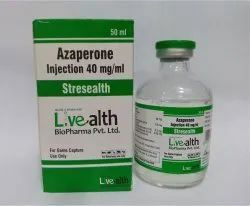 Azaperone is a neuroleptic sedative belonging to the butyrophenone class of pharmaceuticals. Butyrophenones work through the mechanism of central dopamine and peripheral adrenergic blockage to produce a strong anticholinergic effect. The other butyrophenone routinely used in wildlife is haloperidol as a longer acting tranquilizer. Packaging Details: 50 ml Vial in a printed carton. 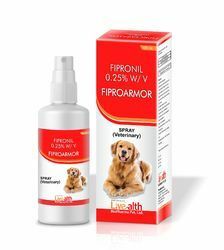 DESCRIPTION:Fiproarmor Plus Spot-On Solution For Large Dogs (20 kgs to 40 kgs) keeps your pet safe from harmful parasites such as fleas, ticks and lice. 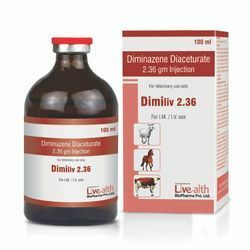 Dimiliv injection is an effective antiprotozoal drug for the treatment of trypanosomiasis, babesiosis and Theileriasis. Trypanosoma congolense, Tryp. vivax and Tryp. brucei. Babesia bovis, Bab. bigemina, Bab, ovis, Bab. motasi and other species of Babesia, Theileria annulata. 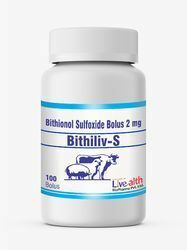 Bithionol Sulfoxide is an active anthelmintic for the treatment of fascioliosis and paramphistomosis, and has good activity against adult Oesophagostomum and some cestodes (Thysaniezia, Moniezia). It is also acting as an intestinal disinfectant. Packing: 100 Bolus in a Jar. Packaging Details: 100 Bolus in a Jar. 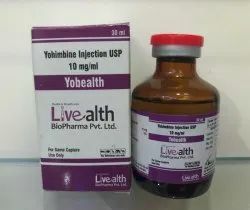 Yohimbine is an alpha-2 adrenergic receptor antagonist that easily penetrates the blood-brain barrier. It competitively blocks and antagonizes central nervous system depression or sedation and the bradycardia and respiratory depression caused by xylazine. Packing: 30 ml Vial In a printed carton. Packaging Details: 30 ml Vial in a printed carton. Medetomidine. Medetomidine is a synthetic drug used as both a surgical anesthetic and analgesic. It is often used as the hydrochloride salt,medetomidine hydrochloride, a crystalline white solid. It is an α2 adrenergic agonist that can be administered as an intravenous drug solution with sterile water. Oxytetracycline was the second of the broad-spectrum tetracycline group of antibiotics to be discovered. 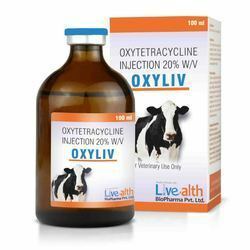 Oxytetracycline works by interfering with the ability of bacteria to produce essential proteins. Without these proteins, the bacteria cannot grow, multiply and increase in numbers. Oxytetracycline therefore stops the spread of the infection and the remaining bacteria are killed by the immune system or eventually die. Oxytetracycline is a broad-spectrum antibiotic, active against a wide variety of bacteria. However, some strains of bacteria have developed resistance to this antibiotic, which has reduced its effectiveness for treating some types of infections. Ivermectin is derived from the avermectins, a family of potent,broad-spectrum antiparasitic agents isolated from fermentationof Streptomyces avermitilis. 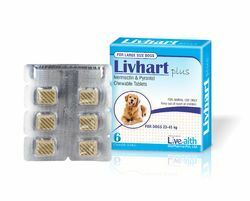 LIV-MAC Injection is a clear, ready-to-use, sterile solutioncontaining 1% ivermectin, 40% glycerol formal, and propyleneglycol, q.s. ad 100%. 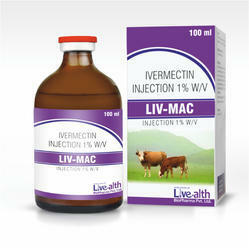 LIV-MAC Injection is formulated to deliverthe recommended dose level of 200 mcg ivermectin/kilogram ofbody weight in cattle when given subcutaneously at the rate of1 mL/110 lb (50 kg). 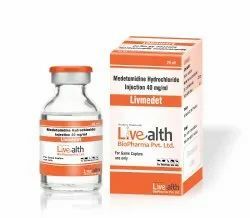 In Swine, LIV-MAC Injection is formulatedto deliver the recommended dose level of 300 mcg ivermectin/kilogrambody weight when given subcutaneously in the neck at the rate of 1 mLper 75 lb (33 kg). Packing: 100, 50 ml Vial. Spray and oil spot on. EPA Fipronil works by affecting the parasite's nervous system causing paralysis and death. Fipronil spreads over the body with the body oils in about 24 hours after application killing 100% of the fleas or ticks within 24-48 hours. Fleas and ticks are generally killed before they bite decreasing the risk of flea allergy dermatitis and tick-borne disease transmission. Fipronil collects in the oils of the skin and hair follicles and then is released over time (up to 1 month) from the hair follicles onto the skin and hair. Hair that is shed after treatment will help decrease larvalstages of fleas as the medication is on the hair. Fiproarmor stays on even with bathing, swimming, or exposure to sunlight. Area of application may appear wet/oily for 24 hours. Allow to dry before touching the area. Do not reapply for 30 days. Fiproarmor has been used off label to treat mites including ear mites and demodex. It is not soluble in water and has very little effect on the environment and wildlife. Apply the Top Spot or Fiproarmor Plus oil to the pet's skin not the hair coat. Do not rub in. Individual pipettes are available for weight categories up to 22 pounds, 23-44 pounds, 45-88 pounds, and 89-132 pounds; over 132 pounds use the appropriate combination of pipettes or pipette plus spray. Spray: 1-2 pumps per pound of body weight using the 250 ml bottle or 3-6 pumps per pound using the 100 ml bottle. Pets with long or dense hair receive the higher doses. Ruffle the hair coat while spraying. Hair coat should be damp to wet. To apply to the face, spray onto a glove and then wipe the glove over the face avoiding the eyes and mouth. Do not apply 1-2 days before or after bathing as the natural body oils that help the drug spread will be temporarily removed with bathing. Apply once a month for continual protection from ticks. 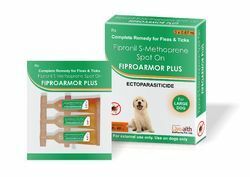 If in an area with few fleas and no ticks, Fiproarmor may be applied every 2-3 months for flea protection. 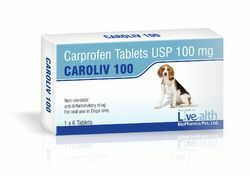 Carprofen is a non-narcotic, non-steroidal anti-inflammatory (NSAID) prescription medicine that helps relieve pain and inflammation in dogs. 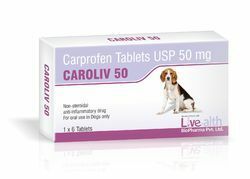 It is often used for dogs with symptoms of arthritis or to control pain following a surgery. ... Postoperative medication to treat pain and inflammation in dogs following a surgery. Packing: 1 x 6 Tablets in a printed carton. Packaging Details: 1 x 6 Tablets in a printed carton. Spasliv injection contains pitefenone, fenpiverinium & nimesulide which acts by powerful muscle relaxant action, controls smooth muscles contractions & potentiates the action of antispasmodic drugs and provides the relief from pain and fever respectively. Ketoprofen is a non steroidal anti-inflammatory drug (NSAID)and cyclo oxygenase inhibitor. It is a potent analgesic,antipyretic and anti-inflammatory. 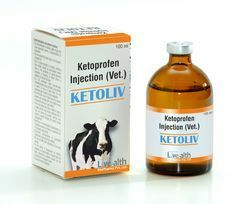 Ketoprofen may begiven by injection or orally. Following oral administration,pain relief and fever reduction usually start within one to two hours. 100 ml In a Vial.